Friday night and for almost 11 hours on Saturday I had a BLAST at Virtual Stamp Night (VSN for short) over at Splitcoaststampers. 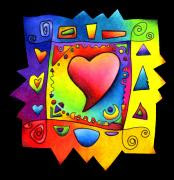 Awesome hostesses put together a series of challenges - one new posting every hour - around the theme, You Make My Heart Sing. I'll try to squeeze in some of my favorites of the SEVENTEEN cards I made for the event. But it was one of the participants' take on a texture challenge that had me thinking. Then when I went magazine cruising for this week's card, the VERY FIRST one I came across lent itself to the technique. I had to do it! This week I used Christmas Crafts for Kids - a Better Homes and Gardens publication from 2002. 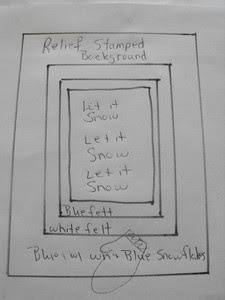 The sky blue background with blue and white snowflakes almost looked like a stamp resist. The mitten on the outside mimics a row of 3 hanging 'clothes line' fashion across the center of the opened card. What I didn't like: Lack of real 'image and lack of texture. The background was busy but it was too flat for my taste. 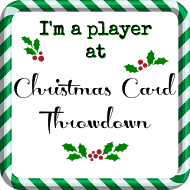 Instead of one big centrally located, multi-layered panel I did 2 separate panels to incorporate an image and make it more Christmas rather than just winter. I haven't settled on an inside quote yet. I'm still shopping. 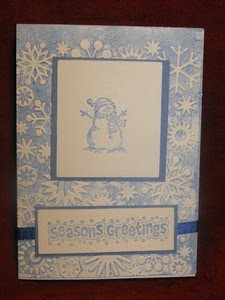 But for the most part, I have 12 of these made to complete the Christmas Card Challenge for February at SplitcoastStampers. Are you thinking Christmas cards? I guess now is as good a time as any to remind you there are only 10 months till Christmas! I love my Secret Sister! 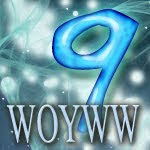 First off, beginning in March I'll have regular topics I post each day. Wednesdays will be for Sewing/ Needlework. I'm hoping spotlighting different areas of my creative vein will help me get some of these UFW (unfinished works) caught up. 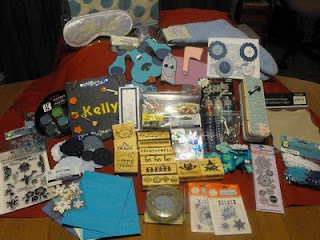 Over at our Quackers thread on Splitcoaststampers, we had our Secret Sister Reveal last night. I've known who mine was for almost 2 weeks as she mailed way early just so my box could sit here and tease me until time to open! Onery isn't she? My Secret Sis was also our Hostess and she devised an AWESOME plan for us to implement. We were to include our interpretation of 11 different categories. The theme was WINTER BLUES BUSTER! Shells Stuff She's on the design team for Clear Dollar stamps and is a whiz with the SCAL program. You'll love her work! Normally I find the CAS card in the magazine and let it be my inspiration. This time I went in reverse. For this week’s Magazine Monday I’m combining a couple of challenges… my own and the one at Stamp2Spend (Splitcoaststampers thread). 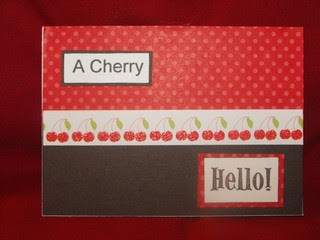 I asked the thread members to create a card using CHERRY. It could be an ink/ cardstock color – as long as that was it’s official name – or use the image of a cherry(s) in some way. I found a strip in a DP from DCWV Sweet Shop slab. And what doesn’t go better with cherries than either chocolate or whipped cream. I went for chocolate with this card and combined it with SU DP from the Brights collection. Hanukkah by Nicole Keller. Notice how the mats are large and the bottom one overlaps both the center band and part of the other. I tried various embellishments on the card but nothing seemed right. When I took them away, the basics seemed to be all I needed. What do you think? Magazine Monday - on Wednesday! Yep. I'm late. Between being gone over the weekend, Monday being the 28th Valentine's Day I've spent with my husband, and his last day home before leaving for three weeks... well, creating just wasn't on the agenda. Tuesday are always spent cleaning. I fret like you would not believe knowing my husband is out on the highway for that 8-hour trip to Chicago. I clean like a madwoman the days he's traveling so I don't have time to worry. So, here it is Wednesday. And I have a springy card that will work for lots of occassions. I am sharing it with a lady who fell on the ice and broke her wrist. Can you imagine being a stamper and having a broken wrist? I'd be going nuts. So I thought this card might brighten her day. The card I'm featuring this week is from Take Ten Volume 4. It is on page 4, 2nd row, 2nd card. 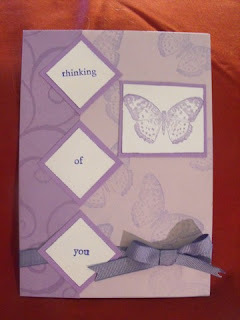 Artist Marianne Harris did a great basic card using Close To My Heart stamps - including a butterfly. Her card is almost identical to mine minus ribbon. I liked the color tones, the layout and the stamped background. But I thought it needed some texture. The bow is done in 2 pieces. The band of ribbon is attached to the card front, then the bow was tied and adhered in place with a glue dot. What spurs you into making a card? Is it the desire to be creative? Is it because you need one for an occasion? But I knew Wally could use some cheering up so when I sat down to create the card for Magazine Monday last night, I knew it had to have a masculine flair. I chose a card from the May 2005 Cardmaker Magazine. 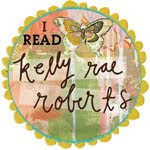 When I pulled the magazine off the shelf, it literally fell open on the desk to Butterfly Wishes by Karen Robinson . The card was all soft green and leaf patterned paper with a butterfly and sheer green ribbon. 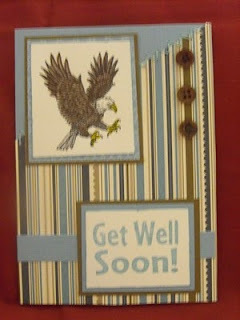 AND it was a Get Well card. I thought it a bit feminine for Wally's card. So I pulled out the Elegant Soiree paper from SU. Have you seen this? It's beautiful, elegant and goes great with Baja Breeze SU CS. I just got this package and am already planning on ordering more next month. Okay, back to the card. 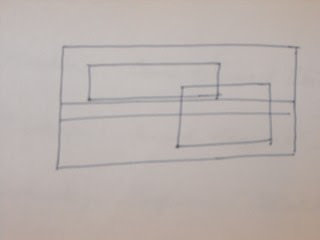 I followed Karen's basic design layout. Where she stitched around both mats as well as where the two papers met, I chose to only do the latter. She used a gold all-purpose sewing thread and machine stitched. I chose to hand pierce and stitch with a blue-toned crochet thread. I replaced the butterfly with an eagle. Wally likes eagles. I also bypassed on the ribbon and just added a touch of the Baja Breeze CS beneath the sentiment mat. Mine isn't as elegant as Karen's. It's more basic and simple. But sometimes it's more about letting you someone know you're thinking of them than it is about the decoration.